The exhibit at the Art Institute was dark in more ways than one. His work was showcased on black walls with one light perfectly positioned on the art. It was a chronological exhibit, so it was easy to see how his art developed over the years. The company of strangers were whispering that his artwork was "disturbing" or "creepy" while I have always found the work of Rene Magritte to be highly imaginative and unique. Rene Magritte was a true innovator who pushed boundaries early in his career. His artistic technique was always clean and very precise. He made beautiful cut outs from sheet music in his early work including my favorite, The Lost Jockey. He was finishing a painting almost every day and had his first exhibition in 1927. The critics gave him terrible reviews so he left Brussels and moved to Paris. He became friends with other creative minds including the founder or surrealism, Andre Breton. As we walk through the dark rooms, I can see how his art changes when he moves from Brussels to Paris. He painted a series of objects where the name of the object was written (in French) underneath it. 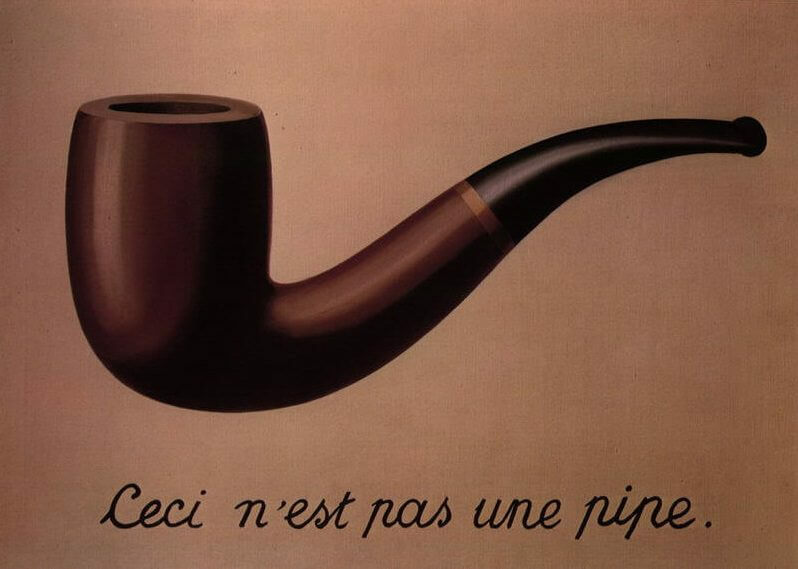 The Treachery of Images is a painting of a tobacco pipe and the text painted on the canvas reads this is not a pipe. He wanted us to think about the meaning of images and the relation to the word. I think he wanted us to be conscious and thoughtful of how we label things. He always challenged the viewer emotionally and intellectually, Girl Eating a Bird is a great example of this. He uses a strong juxtaposition of basic images to create inner conflict. A sweet school girl eating a bird so viscerally stirs your emotions so you are unsure of how to feel about it. Near the end of the exhibit his works are displayed in a long domino row of black walls with a single painting hanging on each wall including Black Magic, The Philosophers Lamp and ending the row was the man painting a bird, Clairvoyance. Walking into a large room of white walls was like a breath of fresh air. A room big enough to house the larger than life paintings, The Threshold of Freedom and The Red Model. The Red Model became one of my new favorite paintings. It is a painting of a pair of boots but you can see the toes that are inside the boots. It is one of the only paintings where you can see the inside and the outside at the same time. On the ground near the boot is a crumpled up piece of newspaper. As I looked a little closer, I noticed French text and a small illustration of Titanic Days, one of his earlier paintings. The exhibit was brought to a close with my absolute favorite Magritte painting, Time Transfixed. 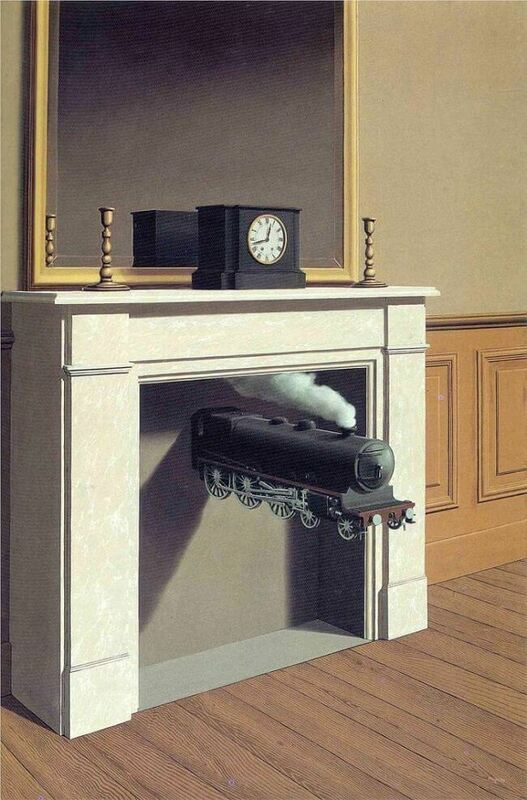 This painting of the train coming out of the fireplace is one of his paintings that is always on display at the Art Institute. I remember the first time I saw it when I was a teenager, I felt challenged intellectually and at the same time completely inspired. I had never seen anything like it before. I stood there for a long time, until someone tapped me on the shoulder and said it was time to leave. After visiting the Art Institute that day I knew I wanted to move to Chicago and be an artist.